The Tiger Express tourist train is a joint initiative of Indian Railways and the Indian Railways Catering and Tourism Corporation (IRCTC). The train aims to create awareness about wildlife in India, particularly tigers. When it the train was initially launched in June 2016, it was to visit two popular national parks in Madhya Pradesh (Bandhavgarh and Kanha), as well as Dhuadhar Waterfall in Bedhaghat near Jabalpur. However, its itinerary has been revised to visit Ranthambore National Park in Rajasthan, plus Udaipur and Chittorgarh, instead. This was partly due to the difficulty of getting confirmed safari bookings at Kanha and Bandhavgarh. The Tiger Express is a "semi luxury" tourist train, with pictures of wildlife covering its exterior. There are two classes of travel -- Air-Conditioned First Class and Air-Conditioned Two Tier Sleeper Class. AC First Class has cabins with lockable sliding doors and either two or four beds in each. AC Two Tier has open compartments, each with four beds (two upper and two lower). For more information read this Guide to Classes of Travel on Indian Railways Trains (with Photos). The train also has a special dining carriage for passengers to eat together and interact. The train departs Saturdays at 3 p.m. from Safdarjung Railway Station in Delhi. It arrives in Udaipur at 9 a.m. the next morning. Tourists will have breakfast aboard the train before going sightseeing at Sahelion Ki Bari. After this, tourists will check into a mid-range hotel (Hotel Hilltop Palace, Paras Mahal, or Justa Rajputana), and in the afternoon visit the Udaipur City Palace followed by a boat ride on the Lake Pichola. Later, everyone will return to the hotel for dinner and an overnight stay. The next morning, tourists will depart by road to Chittorgarh via Nathdwara. The afternoon will be spent sightseeing in the fort, with free leisure time available after evening tea. Later, everyone will transfer to Chittorgarh Railway Station to travel overnight by train to Sawai Madhopur. The train will arrive at Sawai Madhopur Railway Station at 4 a.m. 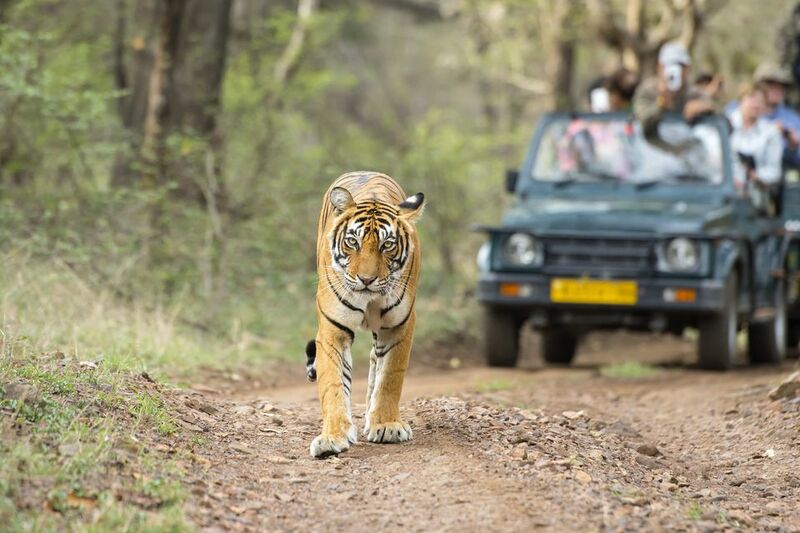 Tourists will proceed to Ranthambore for a jungle safari in a canter (an open-top safari bus that seats up to 20 people). After this tourists will transfer to a mid-range hotel (Hotel Sher Villas, Ranthambore Heritage Haveli, or Hotel Glitz Ranthambore) for breakfast and lunch. Another safari will take place in the afternoon. Following this, everyone will board the train back to Delhi, departing at 8 p.m. Dinner will be served on the train. It will arrive back in Delhi at 4.30 a.m. the next morning. In AC First Class: 37,500 rupees per person, single occupancy. 36,500 rupees per person, double occupancy. 35,500 rupees per person, triple occupancy. 24,000 rupees for a child aged 5-11 years (with bed). 22,000 rupees for a child aged 5-11 years (without bed). In AC Two Tier: 31,500 rupees per person, single occupancy. 30,000 rupees per person, double occupancy. 29,000 rupees per person, triple occupancy. 20,000 rupees for a child aged 5-11 years (with bed). 18,500 rupees for a child aged 5-11 years (without bed). The above rates include journey by air-conditioned train, hotel accommodations, all meals in train and hotels (either buffet or fixed menu), mineral water, transfers, sightseeing and transportation by air-conditioned vehicles, entry fees at monuments, and tiger safaris. An additional surcharge of 18,000 rupees is payable for single occupancy of a First Class cabin on the train. Single occupancy in AC Two Tier is not possible due to the configuration of the cabin. An additional surcharge of 5,500 rupees per person is also payable for occupancy of a First Class cabin that accommodates only two people (as opposed to four). Do note that the rates are only valid for Indian citizens. Foreign tourists must pay an additional 3,000 rupees surcharge per person due to currency conversion and higher fees at monuments. In addition, the rates do not include camera fees at monuments and national park. Bookings can be made on the IRCTC Tourism website or by emailing tourism@irctc.com. For further information, call toll-free on 1800110139, or +91 9717645648 and +91 971764718 (cell). Ranthambore National Park is one of the best national parks in India for spotting a tiger and its proximity to Delhi makes it very popular. The park is situated at the joining of the Vindhya Plateau and the Aravalli Hills, and is characterized by rocky plains and steep cliffs. It supports a diverse range of flora and fauna, and even has an old fort that was built in the 10th century. There are 10 safari zones inside the park. Massive Chittorgarh Fort is one of the top forts in India, and is widely regarded as the greatest fort in Rajasthan. The Fort lastly belonged to the Mewar rulers, whose capital was located there until Mughal Emperor Akbar captured the Fort in 1568. Following this, Marahana Udai Singh II moved the capital to what is now the city of Udaipur. Udaipur is Rajasthan's romantic city of lakes and palaces. The Mewar royal family has developed the Udaipur City Palace Complex into a heritage tourist destination. Many of their personal effects are on display there, and you can immerse yourself in history and really get a feel for how royalty lived.